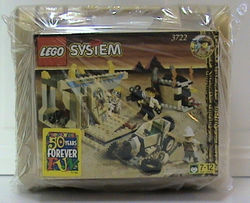 3722 Treasure Tomb is an Adventurers set released in 1998. It was sold exclusively at Toys 'R' Us stores and is identical to 5919 Treasure Tomb. The building instructions were labeled with the number 5919. Three minifigures were included: Johnny Thunder, Baron von Barron and a Pharaoh Skeleton. The set consists of a tomb, a small building and a car. The car is interesting, as it uses a sarcophagus bottom for the rear part of the car. The car has room for one minifigure, equipment clips and a spare tyre on the back. The small building has parrot and fire decorations and launches snakes out the front. The tomb is medium-sized and has a sarcophagus in front and the treasure in back. It is decorated with a hieroglyphic column, wings and parrots. When the sarcophagus is opened, the pharaoh skeleton comes out and a snake pit is uncovered. Accessories included are: a movie camera and film, a pair of black binoculars, a revolver, a rifle, a pickaxe, a black scorpion and two red snakes. Facts about "3722 Treasure Tomb"
This page was last edited on 9 February 2019, at 17:40.